I feel like when ever we demonize the other side, we all lose!!! Please consider that thought. In fact, I consider myself pro compassion more than pro life. I guess some news sources shared Sophie’s story, link in comments. This photo is what I wanted to convey in my speech yesterday! My speech was so hard to write and give on so many levels. But I wanted to share my heart, that my sweet Sophie was a real human with a huge impact even though she was so so tiny. What they didn’t report is that struggle, because I do want Sophie’s story to help people understand the impact a 23 week old baby can have. BUT I also feel such compassion for those who find themselves on the other side of this debate, feeling like they cannot support a pregnancy for whatever reason. In all things in my life I hope to lead with compassion! And I don’t believe in having laws that make it hard for women to make very difficult decisions. I would like better education that sometimes delivery is an option above abortion… I know too many good caring, compassionate people with very compelling reasons why the laws need to stay in place, I think that we come to a compromise and look for protection for precious babies AND allow for exceptions. I wanted to share that as part of my message, too, yesterday, but there is never enough time! I was meant to speak for 5-7 minutes and timed my speech 3 times and was close to 7 minutes at the end, when I got up there it was 16 minutes long. AGAIN! I feel like when ever we demonize the other side, we all lose! In fact, I don’t view people who want more reproductive rights as evil. I have far too many friends who share that opinion. Friends that I love deeply. They are compassionate, caring people! I know I’m definitely more middle of the road in my feelings and really do appreciate learning more. So if you disagree with me, please do so kindly. And extend the same courtesy to everyone you coming contact with. God bless Paul Harvey!!! This poem brings tears to my eyes every time I hear it or watch this great commercial they made about it. The story behind the picture is what makes it so great. One morning, as the sun was rising and my husband walked out to start the day. He reached down for his mud-caked boots and saw our three year old’s mud-caked boots sitting right by them. He snapped a picture and sent it to me. So I did what any good wife would do. I turned that special moment into artwork and gave it to him for Christmas that year and attached the poem to the back. That three year old cries “Daddy” when he gets hurt. All of my kids know their daddy is not only very hardworking, but will take the time to wipe away their tears and be there for the most important things- like dinner at the table even if it means he’ll be up an hour later to finish up his work. Its still harvest season on our farm, so this paragraph really hits home to us. Those of you in Ag understand- a hundred plus hour workweek is the norm during our busiest times. And we still love it!!! We were heartbroken. Devastated. Words cannot describe the feelings I had to see a friend of my own child being in that place. His love of life and amazing attitude really hid the severity of his condition well. We had been chatting with him a few times a week via Facetime and had just taken him on a virtual tour of our farm. He loved the animals and I told him when he felt better he could come out and see the goats. Having baby animals is the BEST part about running a farm, so I told him in May-June he could come and see the babies. Whenever any conception is pla nned it is always a gamble, an act of faith. This amazing little boy’s life was also in jeopardy, so in another act of faith we told Alex that he could name our first girl kid (doeling) born. All doelings born on the farm get to stay and become future mothers. He was so excited. 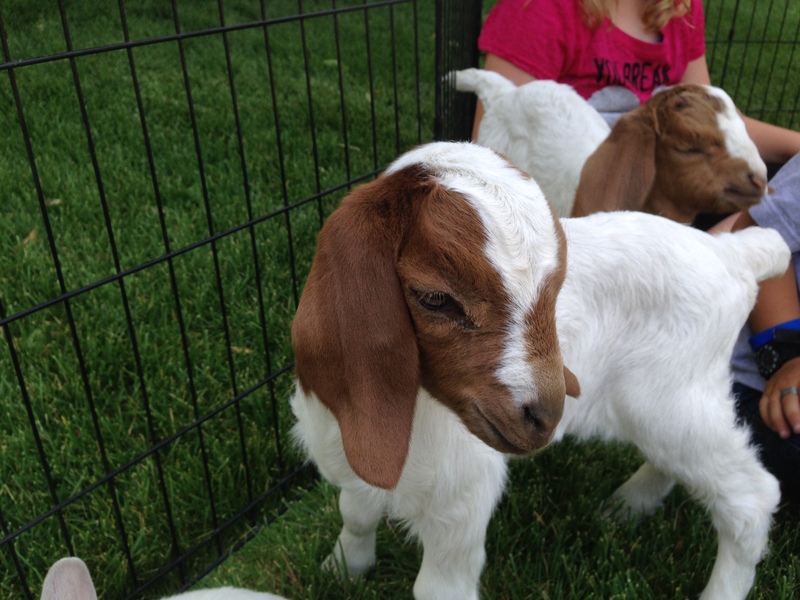 And now- 5 months later we have our baby goats and like we promised he got to name the first doeling. These doelings were a little overdue, and we waited and prayed for them to come. Like any overdue mammal it took a little toll on their health. They were born with weak back legs. It’s a condition that we had to watch and gave some vitamin injections for. These girls are fighters- I think it’s perfectly fitting Gator got to name one of these strong little doelings. Alex is one of the strongest people I know- so this little doe will have the strength and faith of a mighty soul on her side. Yesterday he came over to our farm and chose a name for this beautiful doeling: Izabella (or Bella for short). It was so heartwarming to reflect on the journey this boy has been through. When I asked him if his energy has returned, he said, “Oh yeah, watch me run.” And took off running. 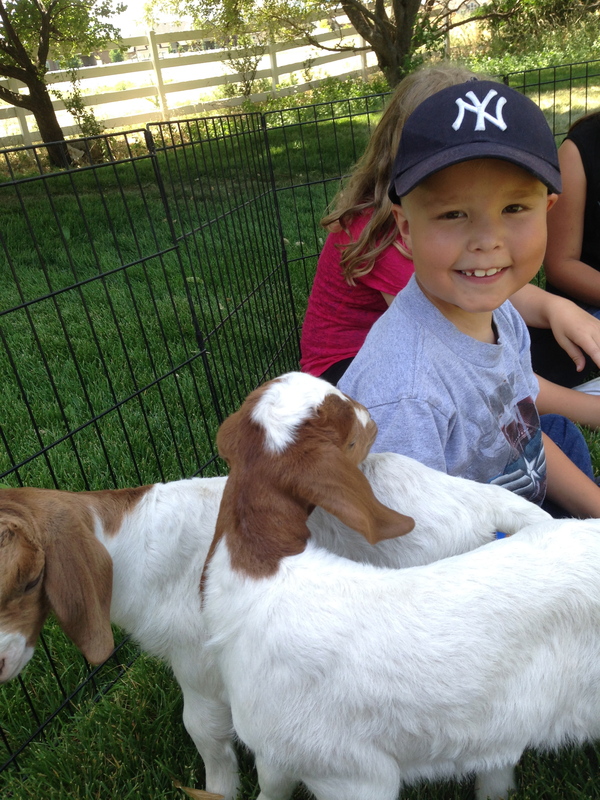 We’re excited to watch this boy and his goat have many happy play dates! I admit I don’t know exactly the locations hardest hit, but some of my farming friends in Michigan were posting these pictures. Its so sad and as a farmer, we know a small bit of the loss this means for them in so many ways. Farming is hard work. And weather can ruin not only a year but an entire farming operation. Despite what certain people try to sell, farmers truly care for their animals. Something will have to be done for these dairy ladies and quick! I have a special place in my heart for Michigan farmers. I was able to attend a Farm Women’s Symposium in Michigan this past Spring and those Michigan farm women are some pretty exceptional ladies! I pray that God will send them comfort and help them to find quick resolution to their problems. On a farm you have to move quickly, because lives are literally on the line. These farmers will be in my thoughts and prayers for a while. My heart aches for all of the farmers affected by this recent tornado. If you are the praying type- these farming friends could sure use your help! What’s in a Name? Am I a… Farm Wife? Farm Girl? Farm Woman? Farmer? Maybe They All Fit! While the feminist in me shouts hooray, huzzah! I DO actually refer to Luke as my husband, my farmer, etc. 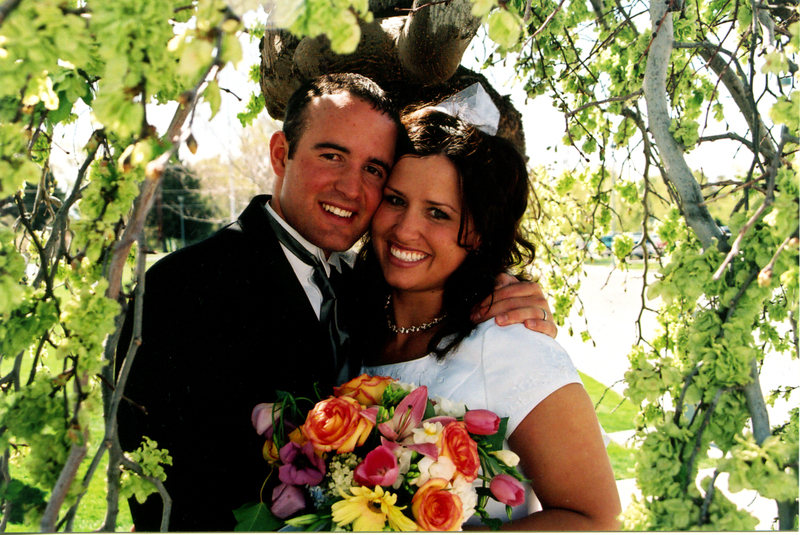 I am completely comfortable referring to myself as his wife. For me, it’s another hat I wear-not a definition of self. Professionally, I refer to myself as an educator, a business owner or a linguist- depending on which job I am referring to. I currently run a small business- the preschool on our farm. I also participate in ongoing training from my master’s degree in linguistics by teaching classes. Overarching all of these, are my church affiliations and service; I also volunteer in my kids’ classrooms, and tutor some young friends in Spanish- I am definitely an educator. BUT – what is my role on the farm? I like to question traditions regularly. Do I try to keep a clean house and make nice meals because it’s expected of me in order to be a good wife? Absolutely not, but if the “good” wife label comes my way, I’ll wear it when I can. In reality, I do it because I love my children and my husband and I want them to eat healthy meals and we all have more peace in our home when it’s clean(ish)– speaking relatively clean here. When we moved to the farm seven years ago, I wasn’t sure what I wanted my role to be. I love my mother-in-law, but we are two different people as far as our interests and efforts go. Some overlap, but not a lot- and that’s fine. After all, how do we progress if there are not intergenerational differences? Assuming leadership of my husband’s family farm, was a hard adjustment for both of us. My farmer grew up seeing his mother involved in activities that aren’t necessarily at the top of my priority list. She is a remarkable woman, and a force to be reckoned with. 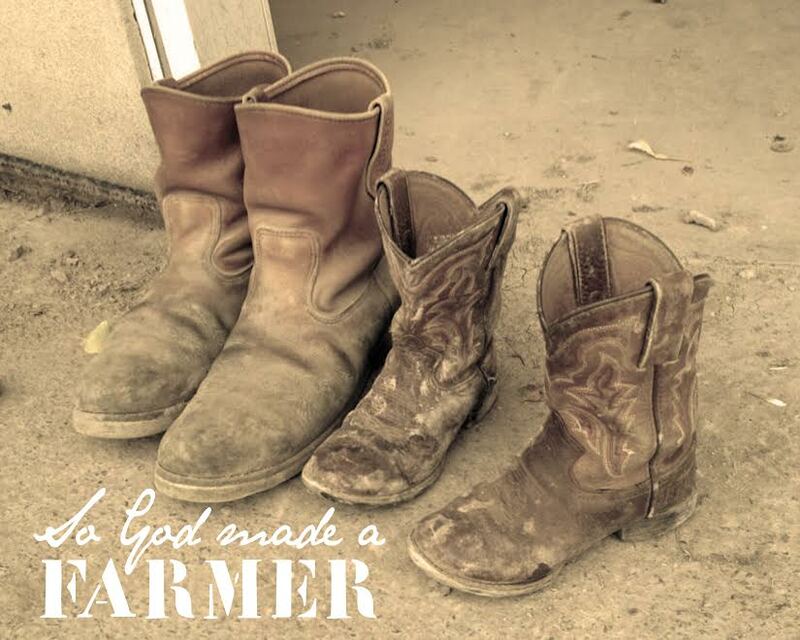 I tried-and failed-to fill her elegant boots, to do everything she did-because that’s what a “farm wife” should do. It wasn’t his fault or her fault or even my fault- more a HUGE learning process. I have learned that I couldn’t be her and manage the interests that I loved-and it was a difficult realization to come to, but one that has given me more peace, more purpose. So I pursued clarity. I sought talk therapy and the advice of MANY friends. From these efforts I learned acceptance. To accept what I am and she is, and who my farmer is, and that it’s OK to be who we were, are, and will be. Acceptance is a skill, and it doesn’t come easy for most of us. Letting go of expectations, whether our own or someone else’s is tremendously hard. Still, farming is a unique lifestyle. I looked for a support group for farm women. AND… I. FOUND. IT. To say it was life changing simplifies it. Almost immediately found that there most certainly is not a cookie cutter farm woman. More like an entire bakery. I have met farm women who are very much involved in the daily farm operations. Several who are “The” farmers themselves-those who labor kneading the doughy base of their farm. Many, like me, do supportive farm work-our work is the icing-the sweet, supplement that adds to the beauty and quality. There are some farm women who don’t do much at all on the farm, except for love and support their farm husbands-they are the sprinkles providing little splashes of love to the doughy grind. These women get that sometimes we just want to scream and yell about the pressures we face without much (any?) monetary compensation. Yet, don’t diminish us with pity. This is, after all, a field we nearly unanimously chose. If not ourselves, our farmers farm because they love it. Farmers understand the importance of balancing love of work and family against the knowledge that our labors ensure our Nation’s security. That as a group we are providing the essence of what sustains all manner of human endeavor. Food. It’s a job, a calling and a challenge. I am continually grateful to those who rise to it. Farmers and their families embrace this in a similar way to Military families. It is a vow of sacrifice, which is often manifested with poverty, injury and even death. Farming is a dangerous, essential and sometimes thankless job. I get emotional thinking about it. I am ashamed that I ever considered farming a less-than impressive occupation. My farmer has a master’s degree as well. Many years our combined incomes qualify us for earned income credit. We laugh at this fact and through our disappointment, yet still cling to the knowledge that we are doing something meaningful- giving service by the sweat of our brow. I was ok with my title of “just” a farm wife. Because like the title of mother and educator, which are also titles that do little to describe the heartache and turmoil AND the joy and bliss that accompany them. I am ok with less glitzy titles. Then this past December, my farmer approached me and said, “I need someone to drive tractor for our Christmas tree lot wagon rides”. I have always LOVED four-wheelers, motorcycles, etc.- so I jumped on that opportunity. It was cold- bitter, bitter, cold some nights, but so fun, so important and so visible. I now drive tractor for our preschool wagon ride tours. I have done something tremendous-no longer solely the glossy frosting or cheerful sprinkles on our farm. “Miss Hilarie the “farmer’s wife” has “leaned in” ALL in. I’ve defined MY role and set my roots. My other titles nor the titles of generations of women before me don’t define the grit, determination and faith it takes to start a 1962 International Harvester when the starter is going out (the fact that prayers were the only thing that worked is DEFINITELY the subject of an upcoming post). I’m going to let you all help me decide, but know, whatever it is it will be hollered with pride—I’ve earned it.